At Solar Sense we take great pride in our installations. We back up the high quality of the systems that we install with attention to detail in how we carry out our installations and we do our best to offer exceptional service to our clients. "After sales service is the best I've experienced!" It's great to be using hot water that I know has been heated by the sun and hasn't cost me anything. I'm glad that I'm contributing to lessening the electricity load in RSA. My electricity bill has been reduced by about R400 per month (summer months...the heating element is never used). The team was an absolute pleasure to have in my house. Very professional and friendly, smartly dressed. I would have felt quite safe leaving them in the house if I'd had to go out. After sales service is the best I've experienced! I've really appreciated Roger's follow up phone calls and interest. I know that if I have any queries they will be dealt with. Marian Roberts - Pinelands, Cape Town. "The installation went very smoothly and Roger and his team worked neatly and efficiently." Solar Sense installed solar heating for our pool shortly after we had our pool built just before winter last year, and it’s amazing that even in winter it upped the pool temperature from 14 to 19 degrees Celsius (we tested this by by-passing the solar piping), making the odd dip in the pool in winter possible. In summer, it’s probably a good 7 degrees warmer. The installation itself went very smoothly and Roger and his team worked neatly and efficiently. I can highly recommend them. The pool company that maintains our pool also commented on what a professional job Solar Sense had done and said they would recommend them. In almost a year that we’ve had the pool and thus the solar heating system, we’ve had no problem whatsoever with the heating system. Diana Cullis - Kenilworth, Cape Town. "Solar Sense is a very professional operator." Besides the obvious feel-good factor, our monthly electricity bill is more or less the same as it was before the Eskom price increases started 3 or 4 years ago. Solar Sense is a very professional operator. They may not be the cheapest but they install quality products and treat clients with respect and offer good advice. Shane Tremeer - Three Anchor Bay, Cape Town. "I cannot express enough your level of professionalism and competence." I want to take this opportunity to thank Roger Pellatt and the team of Solar Sense for the good job they did on our pool. Roger provided us with several pool heating options and never hesitated to change the plan as we changed our minds over one system or another. I cannot express enough your level of professionalism and competence. We are extremely happy with our pool heating! It works perfectly, more pool fun for everybody! An and Frans van Leeuwen - Noordhoek, Cape Town. "The entire process adopted by Solar Sense, from preparing the quote after performing a detailed on site visit, the clear explanations of the work to be done and the completely professional, punctual and thorough installation, was magnificent." After much research, we chose the Heliocol system as it was clear that it is the best technology for solar pool heating available, both from a design and efficiency perspective. Before installing the system, our swimming season was extremely short (typically from late November to early March) as our pool is shaded by overhanging trees. Within one day of installing the Heliocol system, the pool temperature soared from about 24 degrees Celcius to 30 degrees Celcius. There is little doubt that our swimming season is going to be considerably extended, as even on cloudy summer days the pool temperature has been around 28 degrees Celcius. The entire process adopted by Solar Sense, from preparing the quote after performing a detailed on site visit, the clear explanations of the work to be done and the completely professional, punctual and thorough installation, was magnificent. Furthermore, the fact that particular attention was given by Roger to following up on the effectiveness of the installation was very much appreciated. I recommend both the Heliocol product and Solar Sense without reservation. Darron West - Newlands, Cape Town. "The Solar Sense team were exceptionally efficient on the day of installation." We have seen a fabulous increase in our pool's temperature, it has reached 28-29 degrees. Our kids are in the pool every day after school and their friends are constantly asking to pop around to swim as they think it is wonderful to have a pool that is not ice cold! The Solar Sense team were exceptionally efficient on the day of installation, we hardly knew they were around aside from the abseiling they did from our roof. I would recommend Roger and his team without hesitation as from the moment he had quoted us he kept us completely in the loop as far as delivery and installation date were concerned. Every detail on his timeline was fulfilled within the time frame he had promised. Rejeanne and Doekle Vlietman - Edgemead, Cape Town. "Significant power saving of roughly 50% of our previous bill!" Significant power saving of roughly 50% of our previous bill when combined with other energy saving measures we have employed. The job was seamlessly completed – virtually without any intrusion on our building process. Felix Unite - Kalk Bay, Cape Town. "Solar Sense made converting to solar energy easy and cost effective!" Thank you to Roger and his team for the professional, respectful, friendly and efficient way in which the installation was carried out at our home. Solar Sense made converting to solar energy easy and cost effective. The quotation was complete – no hidden costs. The installation was completed in one day and Roger followed up with a on-site visit the next day to make sure everything was working fine. The Eskom rebate process was handled by Solar Sense 100% and we received our full rebate after 6 weeks. Our monthly electricity bill has come down from roughly R500 per month to around R300 per month. Time will tell how effective it is going to be, but we are happy to have chosen Roger and his team and we will highly recommend his business to friends and family. Ester and Peter da Silva - Grassy Park, Cape Town. "We have chosen Solar Sense as our exclusive solar service provider. The assurance of the team’s knowledge and expertise, as well as their attention to detail and after-sales service is very valuable." When the time came to replace our old geyser with a solar installation, we did not hesitate to contact Roger immediately and exclusively. Ever mindful of giving his best to the customer, Roger arrived the same day as our enquiry, counselled us on the most suitable installation for our requirements, and provided us with a quote that afternoon. He and his team were under considerable pressure to do the installation before 30 April, as the Eskom solar rebate programme was expected to come to an end very soon thereafter. The Solar Sense team sacrificed their Sunday so as to complete our installation in time to receive the Eskom rebate. Consistent with our previous experience of Solar Sense, Roger and his team were punctual, efficient and unobtrusive. Our electricity savings commenced immediately (even though the system was installed in autumn), and our first electricity bill after the installation of the solar geyser was almost 30% less than the previous month. We have chosen Roger and Solar Sense as our exclusive solar service provider. The assurance of the team’s knowledge and expertise, as well as their attention to detail and after-sales service is very valuable. "It has been a pleasure dealing with Solar Sense." Roger was absolutely fabulous to deal with, a consummate professional who bent over backwards (working over the weekend) to accommodate a rather tight deadline. 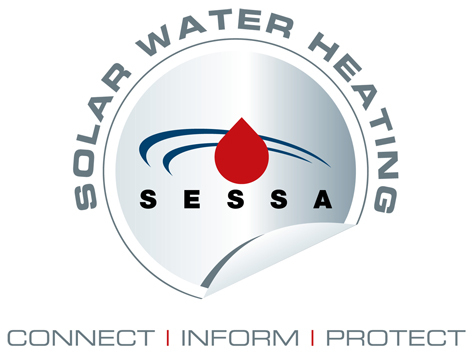 It has been a pleasure dealing with Solar Sense and we wish the team all the best. John Lightfoot - Tokai, Cape Town. "Solar Sense was unbelievably professional, from start to finish, and when there was an after sales/installation question you were extremely helpful and always there to help." THANK YOU SO MUCH for your incredible service in installing our two solar systems. Solar Sense was unbelievably professional, from start to finish, and when there was an after sales/installation question you were extremely helpful and always there to help. We will continue to recommend Solar Sense in the future, as they were one of the top contractors we dealt with when rebuilding our new home! Big bonus for us was the quick repayment of the Eskom rebate!! Your company can only go from strength to strength with your efforts. Graham and Helena Duk - Newlands, Cape Town. "Just a short note to say a very big thank you for the successful solar installation!" Just a short note to say a very big thank you for the successful solar installation. I would also like to compliment you on your professionalism and helpfulness in what you do, from the moment I met you. I wish you every success going forward and I’m sure the percentage of solar installations carried out by you and your team will continue to increase considerably in the near future. If you are asked for a referral at any time, your prospective customer is very welcome to contact me. Jenny Angehrn - Lakeside, Cape Town. "Thanks so much - I am delighted with this addition to my home and can brave the waters almost 365 days a year!" I just wanted to give you an update on our pool temperature since you installed our solar heater in June...I can happily report that since the time of installation our pool temperature has gone up from 14C to 20C and this is in mid winter and what we all considered was not the ideal position for the solar panels! I would also like to thank you for the fabulous service you gave us. The day of the installation went so smoothly and all was finished off neatly. I look upon my system as a thing of beauty and it requires minimal maintenance as the sun does most of the work. Thanks so much, I am delighted with this addition to my home and can brave the waters almost 365 days a year! Carol Dreyer - Claremont, Cape Town.